I have a boxwood that was planted about a year ago and just within the past 7-10 days it has diminished. I have one directly across the sidewalk from it that is doing great and was planted at the same time. What could be going on with it? Both are watered the same and I don't have any animals that would have peed on it and it's getting watered. I would start with pulling back the mulch to check on the soils moisture level. Poke down into the soil to see if the water is draining from around the roots of your shrubs. Watering is crucial in the first year of a newly planted Boxwood, so that they become established. 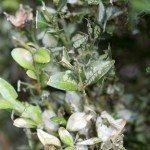 Examine the shrub for any other signs of pests of disease. Neem Oil is a good treatment for pests and can also help as fungicide. These articles have more help for you.